Last week, I cited evidence that statins work to lower risk of heart disease, but their benefit is probably independent of their design function, which is to deprive the body of cholesterol. I believe the benefits of statin drugs come from anti-inflammatory action. Their effect on cholesterol is at best a subsidiary benefit, at worst a cause of multiple systemic problems. Reviewing a handful of studies over 30 years, I didn’t find any consistent relationship between heart risk and blood levels of cholesterol (HDL, LDL or TC). The only exceptions were at the very extremes. Both the top ½% and the bottom ½% had elevated risk of heart attack. Statins tamper with body chemistry that doesn’t need tampering. This line of thinking suggests that alternative anti-inflammatory strategies might avoid the side effects while lowering risk of heart attacks as much or more than with statins. 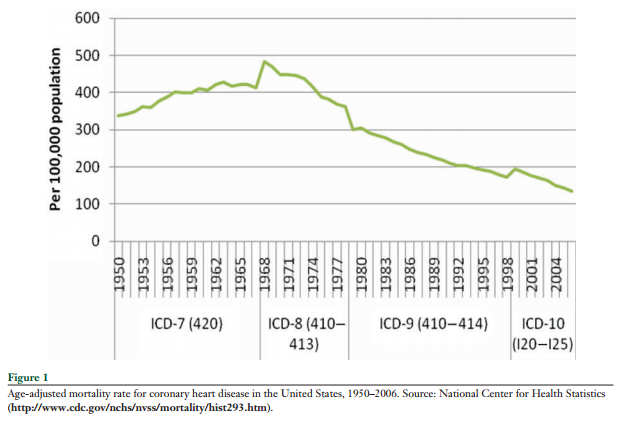 If our NIH had declared “war on heart disease” in 1965, they would be well-justified in crowing today. Since a peak in the 1960s, cardiovascular mortality in the Western world has been declining steadily. The decline is the more impressive in that it has fought twin headwinds in the form of an epidemic of obesity and an aging population. The rise of statin prescriptions may be part of the story, but statins only came into widespread use beginning 1995-2000. The prevalence of smoking started declining steeply in 1965, and this is surely a contributing factor. Other than that, experts can’t seem to agree on the cause of our good fortune. Statins don’t just affect blood chemistry, but interfere with the manufacture of cholesterol. But cholesterol is an important ingredient in cell membranes and nerve sheaths; it is also a substrate from which other essential molecules are manufactured, including vitamin D. It is no surprise that statins carry powerful complications. All the side-effects come from the cholesterol metabolism, and not the anti-inflammatory action, so they may be completely unnecessary. Lowering inflammation ought to improve insulin sensitivity. But most statins are associated with elevated risk of diabetes. Since loss of insulin sensitivity is a primary driver of aging, even marginal effects on insulin resistance could be important. Diabetes is an independent risk factor for heart disease [ref]. Simvastatin seems to have the worst effect on insulin sensitivity, and pravastatin may actually improve insulin sensitivity [ref]. Cognitive impairment is of great concern for most of us, but it is difficult to measure reproducibly. There are enough subjective reports of cognitive impairment from statins to be worrisome [ref, ref] but there may be a slightly lowered risk of dementia (as you would expect from an anti-inflammatory) [ref]. Muscle cramping (myalgia) is reported in some industry-sponsored studies to be 18% or 5% or even as low as 3%. But in my small sample, everyone I know who takes statins notices muscle cramps. This rises from being a nuisance to a clinical risk when it interferes with patients’ ability to exercise, which is potentially a more powerful heart protector than statins. Probably related, people on statin drugs report fatigue and intolerance to exercise. Statins interfere with the energy metabolism, and in particular reduce the concentration of CoQ10=ubiquinone, which already declines with age and is essential for mitochondrial function. Everyone who chooses to take statins should be supplementing with CoQ10. Exercise. The #1 most cardioprotective form of exercise is interval training. The #1 most difficult discipline to maintain is: interval training. Establish an exercise program you can live with, and then live with it. Intense exercise makes a world of difference, but even taking a walk a few times a week has significant benefit. Less meat, more Mediterranean in your diet. Vegan seems to help. If you can tolerate it, a raw foods vegan diet is all-purpose for weight loss, heart health, anti-inflammation, and anti-cancer. Other anti-inflammatories include turmeric, fish oil, boswellia, cat’s claw. A reader has alerted me to the potential of anatabine citrate. This is an alkaloid compound found in small quantities in nightshade vegetables and tobacco. Some people who have taken it say it is the best anti-inflammatory ever, but it was taken off the market 2 years ago based on a scandal that was purely political and had nothing to do with the biological merits of anatabine. Supplement with CoQ10 [Ref1, Ref2, Ref3, Ref4] or ubiquinol, which is offers enhanced absorption for a closely-related molecule. Both kinds of dietary fiber decrease heart risk. (The reasons for this are still debated, and may include intestinal flora, appetite control, and speed of food absorption.) Wheat bran and leafy greens are the best sources of insoluble fibre (“roughage”). Oat bran, beans and nuts are the best sources of soluble fibre. Supplement with niacin (vit B3). Niacin raises HDL and cut risk of heart attacks by 30% in people not taking statins in a meta-analysis. Mechanism of niacin explained here. Am I being inconsistent in saying that cholesterol has nothing to do with heart risk and then recommending a vitamin that raises HDL (good cholesterol) levels? Perhaps so, or perhaps I’m hedging my bets. In include this recommendation because there is independent evidence linking niacin not just to HDL but also to a lower rate of CV events. Hawthorn(e) berry seems promising, and some naturopaths have had good results prescribing it for congestive heart failure. Cut sugar and grains to keep up your insulin sensitivity. Diabetes is a heart risk factor. Avoid foods high in iron. Don’t supplement iron, unless you have been diagnosed with a deficiency. [Ref1, Ref2] Donate blood. Heart disease is no longer the #1 Killer that it was decades ago. Doctors are still looking at blood cholesterol to tell people when they are at high risk, and in fact, for most people, cholesterol levels are not related to risk of heart disease. BMI, physical activity and blood pressure are much better predictors of heart risk. Statin drugs lower your risk of heart disease, but there are other measure you can take that are both more effective and have less side effects. John Aronson says the only proven benefits for statins are for males who have already had one heart attack. Keep in mind that everything I have reported here is based on a general population, averaged over all genetic types. A number of different genetic variations may make you more or less vulnerable to heart disease in a particular way, and may mandate a particular treatment. Take your 23andMe profile to someone who knows how to interpret it. Appendix: Why do doctors prescribe drugs that don’t work? A friend of mine recently retired after working as a VA doc for 25 years. She saw her most effective role as getting patients off some of their many medications. When a student of mine told me that her doctor was prescribing statins, I asked my friend for a doctor who would give her a different perspective. She said she knew of no one who would advise against statins? How could that be? The explanation involves liability law. There are no guarantees from any treatment, and every doctor knows that some of his patients will have heart attacks. If a patient suffers a heart attack and sues the doctor who had managed his regimen, the doctor can be liable even if he has given the best advice and prescribed the best course. He cannot be liable if he does the same thing that everyone else does. The doctor’s liability depends not on whether he did the right thing, but whether his advice conforms to the prevailing standard of care. It gets worse. Suppose a brave doctor decides that he’s going to do the right thing and, he’s willing to take the risk that his patients might sue him later. His insurance company won’t let him do that. He becomes uninsurable, and without insurance he dares not practice medicine. This is how liability law and insurance economics work to effectively suppress diverse diverse approaches and hold back innovation for decades after the consensus of the medical community may have shifted. Did you seriously recommend taking ibuprofen every day? Very serious consequences to that. My husband was diagnosed with diabetes 2 about 3 months ago. We immediately began using a food plan, and within 2 weeks his numbers went from the frightening 440, down to 100 !!! We added a brisk 1 mi. walk, and eliminated sugar, white flour and white rice, and upped our raw fresh veggies, nuts, and seeds. We switched to coconut, avocado, Hemp and Rice Bran oils, and minimized even their use. He is the picture of excellent health today at the age of 71. His energy is back up to normal, and his skin color is beautiful! We are SO thankful Sheryl Wann from Toronto, on her site myhealthlives.com/how-i-freed-myself-from-the-diabetes/ told us about a book to cure diabetes! And THANKS to Rachel again!!! You don’t mention a dosage for niacin. I have been taking it for years. High doses (1000+ mg daily) can lower cholesterol significantly but carry of risk of detrimental liver effects. So you might need to monitor that. I believe the negative effects are reversible by stopping supplementation. Also, the form of niacin is important. The flush-free niacin (really niacinamide) I don’t think thinks works. I think the sustained release form is more dangerous to liver but that is my opinion. The free form, I think, is best but you need to get use to the flush feeling by building up the dose slowly. I have experience with niacin dosage and effectiveness that may be interesting, if not useful. Nearly 20 years ago, my doctor recommended that I consider action to change my cholesterol levels: my total cholesterol was less than intervention levels, but my LDL was high and HDL barely measurable. In addition, most of my older relatives had CHD. Statins were expensive at the time so he recommended trying niacin, if I could tolerate the ‘niacin flush’. We monitored lipids and liver enzymes quarterly. At 2000 mg daily, my total cholesterol had fallen to ‘ideal’ levels and HDL/LDL balance similarly improved. Liver enzymes were within the normal range. As a side benefit, persistent annoying psoriasis on my hands cleared up. If I went off niacin for a week, it flared up again, but disappeared with two weeks of re-starting. The niacin flush was a problem though so I tried slow-release niacin. It was not as efficacious and by the time daily dosage had reached 3.8 gms daily, it was adversely affecting liver function with little or no impact on lipids. At that point I switched to statins and am still on them, though still experimenting with ‘species’ and dosage, due to tendonitis that seems related to dosage and variety of statin. That is important as I have demonstrated conclusively that exercise and diet have much greater impact on my lipids than statins do, so if it is a choice between staking a statin or being able to ‘break a sweat’ while exercising, the latter is much better for my health. Josh: You mentioned iron, which is the topic of my new book, Dumping Iron (http://www.amazon.com/Dumping-Iron-Secret-Killer-Reclaim/dp/1530069505/). Differences in body iron stores are likely the source of the huge difference in heart disease risk between the sexes. At age 45, men have 4 times the iron of women, and 4 times the heart attack rate. Women are largely protected from heart disease until menopause, since until then they have naturally low iron; menopause causes iron levels and heart disease risk to rise. As you noted, blood donation, which lowers iron, is associated with lower rates of heart disease. Interestingly, many of the other interventions that you mentioned are connected with iron. Exercise, for instance, lowers body iron stores. (A paper just out shows for the first time that even low-intensity exercise does this: https://www.ncbi.nlm.nih.gov/pmc/articles/PMC4669095/) The Mediterranean diet results in half the body iron stores in elderly men as compared to a standard Western diet. Long-term low-dose aspirin results in lower body iron. Curcumin, quercetin, and green tea extract are all iron chelators – mice on curcumin develop iron deficiency. Statins can modulate iron metabolism. The list goes on. Iron is implicated in many other diseases in addition to heart disease, such as cancer, diabetes, and infections, and is strongly implicated in aging. It’s all in my book. There are numerous reports that some statins have anticancer effects; this may well be another anti-inflammation effect. This has some medical acceptance as well. Thank you for your excellent advice, Josh. I’d never be able to track down all the info you offer, much less understand it and the implications the way you do. To share your smarts is noble. Salutations, namaste, and job jolly well done! To add to your findings; which i totally agree with, i would like to send you these links to give you some more ‘food’ for thought. Vitamin K should be high on that list. A few thousand participants then started taking vitamin K supplements, and their risk was shown to drop. Part of what vitamin K does is prevent calcium from being erroneously deposited in arterial walls, and instead ensure it is deposited in bone. Studies have shown decreased bone density, increase arterial hardening, and lower vitamin K levels are all correlated. Much like vitamin D, the US RDA for vitamin K comes from a specific syndrome that results from too little intake (inability to clot), yet the healthy level is far, far higher than the RDA. Vitamin K is naturally found in dark leafy greens … take a regular and high volume of a variety of dark leafy greens (safer/better option) than by bottle supplement. Look into green smoothies that will give you a lot of other nutrients and benefit than a narrow dose of one nutrient ala prepackaged supplementing. Thank you for your highly disciplined reviews on this blog. I just pre-ordered your book on Amazon. One very minor tid-bit: Barley seems to outperform Oats in dietary fiber judging from Bowes & Church’s Food Values (1997). I’ve never seen barley bran for sale, but most health food stores carry oat bran. I don’t know how palatable Amaranth is by itself, and only in pumpernickel do you get 100% Rye flour. The figures are generally for Total Dietary Fiber but note that the Barley example is “pearled” indicating that the outer hull has been removed and would, therefore, contain a lower amount of insoluble fiber. If you were to use “hulled” barley instead of “pearled,”, you would get the bran and higher amounts of insoluble fiber. We should not be comparing by the cup but by the calorie. A lot more of that cup of bran is air compared to a cup of barley. Membrane research is also helping rehabilitate the reputation of cholesterol, which has long been vilified as the culprit in the modern-day scourges of cardiac disease, heart attacks, and stroke. In a case of guilt by association, high levels of cholesterol are present in 35 percent of patients with cardiovascular disease, and at sites of vascular damage, the endothelial cells, the inner lining of blood vessels, are loaded with cholesterol droplets. But I want to offer a more nuanced view of cholesterol, which is often lost in the rush to demonize it. Cholesterol is a lipid molecule that plays a vital role in our day-to-day survival. It is, for example, the precursor for the synthesis of important steroid molecules, including the bile salts used in digestion, regulatory steroid hormones such as estrogen and cortisol, and vitamin D.
More relevant to this chapter, cholesterol is an essential component of the membrane whose function is required for the survival of our 50 trillion cells, which is another way of saying our survival. Cholesterol helps the membrane maintain a very important balancing act: it must be rigid enough to physically resist the strain placed on it by the cytoplasm it encloses, yet supple enough to accommodate the flexibility required for the movement of cells. Membrane fluidity is also of great importance in controlling the cell’s “brain” function because it impacts the membrane’s ability to read and respond to environmental information. To function normally, IMPs, in the form of receptor and effector molecules, must be able to engage one another by freely circulating within the membrane’s inner, oil-loving, hydrophobic core. It is the viscosity of the membrane’s lipid core that controls the ability of these proteins to circulate freely. A membrane made up only of phospholipid molecules would be quite fluid, so it would enhance the mobility of IMPs, but it would not be rigid enough to hold up under the pressure generated by the enclosed cytoplasm. These vital roles suggest that cholesterol should not be considered a feared evil villain but instead just a foot soldier doing its duty somewhere down the line of command. I was never predisposed to convicting cholesterol for causing heart disease because when I was transitioning from the laid-back life of a Caribbean lecturer to the far more frenetic life of a scientist at research juggernaut Stanford, I spent time at what I describe jokingly as a research halfway house at Pennsylvania State University in the lab of Theodore M. Hollis, a gifted scientist I met when he guest-lectured at the island med school. When I was in his lab, Ted showed me samples of blood from the specialized strain of rats he used to study human atherosclerosis, the hardening and narrowing of arteries that is the leading cause of death in the United States. These animals had so much cholesterol in their systems that their blood was milky white. Despite their apparently toxic level of cholesterol, these rats did not form endothelial cell plaques typical of atherosclerotic blood vessels. The secret . . . Ted added an over-the-counter antihistamine drug (the same kind that allergy sufferers turn to regularly) when he introduced the cholesterol. Because the antihistamines could override cholesterol’s apparent role in atherosclerotic plaque formation, his work showed that the mere presence of the cholesterol was not the driving force behind a blood vessel’s malfunction. Since antihistamines protected the rats, Ted’s research obviously suggested an alternative culprit: histamine. (Note: Despite my friend Ted’s exciting research on rats, I am not advocating that humans load up on antihistamines! The research is too preliminary for that, and, as you know, I think that all too often, biomedicine rushes to drug solutions without fully understanding their side effects.) Histamine is a stress-related hormone that prepares the body to deal with anticipated injuries and inflammation when the fight-or-flight response is activated by a perceived stressor. Now decades later, the role of histamine in facilitating atherosclerosis has been confirmed. In recent mice studies, the genes for histamine synthesis were experimentally “knocked out.” These genetically modified mice, unable to synthesize histamine, resisted the influence of stressors that led to inflammation and atherosclerosis in control mice. And the protective results observed in histamine-free mice were independent of serum cholesterol levels. (Wang, et al, 2011) The results of animal studies point to the role that chronic stress plays in the creation of histamine and in the onset and exacerbation of atherosclerosis and promotion of cardiovascular disease. In direct contrast to the implied role of cholesterol in causing heart disease, cardiovascular pathology may instead primarily result from environmental stressors rather than genetic or biochemical dysfunctions. Though this research argues against the medical establishment’s rush to judgment against cholesterol, that rush was fueled by the interests of the pharmaceutical industry. Of course, that’s because the drug companies had come up with another one of their beloved magic bullets, this time in the form of statins. Statins are a class of drugs used to lower levels of cholesterol in the blood by inhibiting a liver enzyme responsible for producing 70 percent of the body’s cholesterol. Statin drugs were originally intended for high-risk cardiac patients, but someone, likely in sales, came up with the idea that statins might be good for primary prevention to help those at risk of developing heart disease in the future as well. The statin approach to treating cardiac disease is yet another expensive war with a very poor prognosis. As of yet, we haven’t found the “weapons” of mass-cardiac destruction. Instead of continuing to search, perhaps it’s time (actually, way past time) to revise the conclusion that cholesterol is culpable for cardiovascular health issues and shift our attention to environmental stressors rather than genetic or biochemical dysfunctions. The origin of 90 percent of cardiovascular disease is not due to an organic dysfunction in the cell’s mechanisms, but rather represents a behavioral response driven by environmental signals in the blood. The brain secretes blood-borne hormones, stress factors, and inflammatory agents in order to coordinate the function of 50 trillion cells to sustain life. This insight returns us full circle to the story of the magical mem-Brain because the cell membrane is the information processor that provides the interface between biology and our brain’s perception of the environment. A more complete understanding of cholesterol’s vital role in membrane information processing makes it apparent that disturbing cholesterol metabolism with statin drugs is tantamount to throwing yet another monkey wrench into the machine. New data showing a drug which lowers LDL and raises HDL does not improve cardiac outcomes. Falls right into line with your thesis. As to Mediterranean Diet, I’ve recently made a quick review of the main benefits of this diet. A recent study has been presented at the American College of Cardiology’s 64th Annual Scientific Session (San Diego, CA, March 14-16, 2015). Based on a representative sample of more than 2500 Greek adults, it demonstrates that subjects who closely followed the Mediterranean diet were 47 percent less likely to develop heart disease over a ten-year period, as compared to similar adults on a different diet. Among the study’s participants, adherence to the Mediterranean diet was more protective than physical activity. Cardiovascular diseases are the main cause of death, both in US and in Europe. Evidence suggests that high levels of triglycerides (fats) in the blood after meals, known as postprandial lipemia, are associated with an increased risk for hardening of the arteries, forming the base for heart attack and stroke. Researchers from many Universities have shown promising results in reducing postprandial lipemia by many components of the diet. In a study led by King’s College in London, a diet that combines unsaturated fats with nitrite-rich vegetables, such as olive oil and lettuce, can protect you from hypertension, another critical factor in the development of cardiovascular diseases. According to the researchers, the results of this study help to explain why previous researches had shown that a Mediterranean diet, supplemented with extra-virgin olive oil or nuts, could reduce the incidence of cardiovascular problems like stroke, heart failure and heart attack. The metabolic syndrome is a disorder of the energy storage and use process, currently diagnosed by the combination of three out the five following conditions: abdominal obesity, hypertension, elevated fasting blood sugars, high serum triglyceride concentrations and high LDL/HDL cholesterol ratio. The prevalence in US is about 34% in adults, increasing with age; in Australia is known by the acronym CHAOS (Coronary artery disease, Hypertension, Atherosclerosis, Obesity and Stroke). The Mediterranean diet has proven beneficial effects not only regarding metabolic syndrome, but also on its individual components including waist circumference, HDL cholesterol and triglycerides levels, blood pressure and glucose metabolism. According to Spanish researchers, a Mediterranean diet supplemented with extra-virgin olive oil or nuts may help reverse this condition. The article has been recently published on the Canadian Medical Association Journal. According to a study recently published on the British Journal of Cancer, women who eat a Mediterranean diet could cut their risk of having a womb cancer by more than half. These are the findings of a group of Italian researchers, who looked at the diet of over 5,000 Italian women to see how closely they stuck to a Mediterranean diet and whether they went on to develop womb cancer. This team of researchers broke the Mediterranean diet down into nine different constituents, including vegetables, fruits and nuts, pulses, cereals and potatoes, fish, monounsaturated fats but little meat, milk and other dairy products. They found that women who ate at least seven out of the nine components of the diet lowered their risk of endometrial cancer by 57 percent. “Cancer risk is affected by our age and our genes, but a healthy lifestyle can also play a part in reducing the risk of some of these diseases. Not smoking, keeping a healthy weight, being active, eating healthily and cutting down on alcohol helps to stack the odds in your favour”, that’s what the researchers are telling us. Adhering to a Mediterranean-style diet may significantly reduce the risk of developing chronic kidney disease, according to a study published in a recent issue of the Clinical Journal of the American Society of Nephrology. It is well known that chronic kidney disease is a growing epidemic with many people still experiencing declining kidney function while ageing, despite significant progresses in clinical protection and prevention of risk factors. The researchers examined the association of varying degrees of the Mediterranean diet on long-term kidney function in an observational, community based, prospective study. In their analysis of 900 participants followed for nearly seven years, they found that dietary patterns closely resembling the Mediterranean diet were associated with a 50% lower risk of developing chronic kidney disease and with a 42% lower risk of experiencing rapid kidney function decline. A study published in the Endocrine Society’s Journal of Clinical Endocrinology and Metabolism shows that consumption of a Mediterranean diet enriched with olive oil for two years is associated with increased serum levels of calcitonin, thus suggesting a protective effect on bone. Age-related bone mass loss and decreased bone strengths affects women as well as men in the elderly, representing an important risk factor for osteoporosis and fracture. Many studies had previously shown that the incidence of osteoporosis in Europe was lower in the Mediterranean basin. The traditional Mediterranean diet has been indicated as a possible environmental factor which underlines this difference. Researchers have found that the concentration of total osteocalcin and other bone formation markers were significantly higher in subjects who had been following a Mediterranean pattern including olive oil for at least two years, with no significant changes in serum calcium. According to Spanish researchers who led this study: “This is the first randomized study which demonstrates that olive oil preserves bone in humans, at least as inferred by circulating bone markers”. Alzheimer disease is the most common type of dementia in the elderly. The Mediterranean pattern has shown positive effects not only on the incidence of Alzheimer disease but also on cognitive decline, with an improved Mini Mental State Examination Test score. Alzheimer disease affects over 30 million people worldwide, but the prevalence is lower in Mediterranean countries. There is a consensus among scientists that the high concentration of healthful monounsaturated fats contained in olive oil, largely consumed in the Mediterranean diet, could play an essential protective role in the development of Alzheimer disease. More recently, an article published on the Journal of the American Chemical Society has shed new light about the role of olive oil in the prevention of the disease, suggesting that the real protective agent might be a substance called oleocanthal. This component of extra-virgin olive oil helps decrease the accumulation of beta-amyloid (Aβ) in the brain, believed to be the culprit of that kind of damage currently observed in Alzheimer disease. The report concludes that: “Extra-virgin olive oil-derived oleocanthal, associated with the consumption of Mediterranean diet, has the potential to reduce the risk of Alzheimer disease and/or related neurodegenerative dementias”. The Mediterranean diet is a modern dietary recommendation which has its origin in the dietary pattern typical of large parts of Greece, including the island of Crete and of southern part of Italy, hence its name. The fifth Session of the Intergovernmental Committee of the UNESCO for the Protection of Cultural Heritage met in Nairobi on November 2010, placed the Mediterranean diet on the prestigious list which represents the Intangible Cultural Heritage of Humanity. This important award has accredited the Mediterranean lifestyle as a world-class excellence. The negative effects of statins is nothing new and good alternatives are out there. If you want to know of a doctor who has been shouting this from the rooftops for years look no further than Dr. Whitaker. (http://www.drwhitaker.com/ ). I know, he runs a business and sells supplements but he also has been proven correct on numerous issues many times over the years. If I had a serious health issue I wouldn’t hesitate to seek his advice for alternative therapies. Too many people imo have been caught up in the debate as to the effectiveness of statins and ldl reduction as a direct cause in cvd incidents. The question as to wether ldl is the best indicator is certainly very debatable and as you state levels of CRP show promise and should be considered a potential primary risk factor along with triglyceride, Hdl, ldl levels and ratios to give a better overall picture of Cvd risk potential in combination with patient history etc. Having read a number of the meta analysis I believe there exists clear evidence in the literature that cvd events are decreased with statin use, I don’t think this is a debatable point. What is debatable is the dosing, especially given the common side effects. Unfortunately the studies conducted on lower dosing regimes that I’ve read usually focus solely on ldl target reductions. One interesting study ive recently read found Crestor lowered mean ldl by 26% at 5 mgs daily, quadrupling the dose to 20 and then doubling that dose to the maximum 40mgs only managing mean reductions of approx 38 and in the early 40 percentiles respectively. it would be nice to see more studies exploring the benefits of lower dose statins therapy, whilst there have been a few, there is as you have covered, not a lot of interest in these types of studies by the commercial backers of these drugs. Another note you compare aspirin favourably to statins and its benefits in cvd primary prevention. I believe there is potential that low dose statin therapy can be an important addition in primary prevention (as aspirin is currently used) in individuals with certain risk factors (eg strong family histories of cvd) and that low dose statin therapy can complement aspirin use, given aspirin and other NSAIDS do not effect CRP levels and do not reduce VLDL LDL etc, which still cannot be discounted as a substantial risk in factor in CVD.